Ogden Nash was one of the most commercially successful English-language poets of the twentieth century. 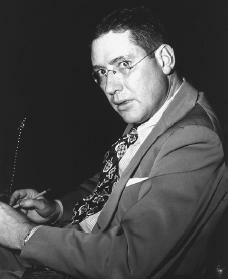 Frederick Ogden Nash was born in Rye, New York, to Edmund Strudwick Nash and Mattie Chenault on August 19, 1902. His father was in the import-export business, but the Nash family's ancestry in North Carolina stretched back to the American Revolutionary era; the city of Nashville, Tennessee, was named in honor of an ancestor. Nash grew up in various East Coast communities and also lived in Savannah, Georgia, during his youth. He attended St. George's School in Newport, Rhode Island, and he was accepted to Harvard but dropped out in 1921 after a year. Nash held a variety of jobs but none for very long. He worked on Wall Street as a bond salesperson, but sold only one bond—to his godmother—and instead spent his afternoons in movie theaters. He was a schoolteacher for a year at St. George's School, and from there he was hired as an advertising copywriter for streetcar signs. In 1925 he was hired in the marketing department of the Doubleday publishing house and did well enough that he moved on to its editorial department as a manuscript reader. Nash said that it was the poor quality of the manuscripts he read that led him to try to write. He attempted to produce serious verse in the style of the eighteenth-century Romantic poets but soon gave it up. He preferred to scribble comic verse on pages that he crumpled and tossed across the office to the desks of coworkers. This led Nash and a friend named Joseph Alger to work together to produce a 1925 children's book, The Cricket of Carador. A few years later, Nash teamed with two Doubleday coworkers to produce Born in a Beer Garden; or, She Troupes to Conquer, which made fun of classic literature. In 1930 Nash wrote a poem called "Spring Comes to Murray Hill" and submitted it to the New Yorker, one of the most respected, well-read magazines of the day. Nash had thought up the poem while gazing out his office window and thinking about his life. The New Yorker published the poem and invited Nash to submit more; his regular appearances in the magazine led to a contract for his first work, Hard Lines, published in 1931. It was a tremendous success, going into seven printings in its first year alone. Nash soon quit his Doubleday job. During the 1930s and 1940s, Nash's poems continued to appear in many magazines and published collections, and he was praised as one of America's greatest humorists (writers of clever humor). He found great success with his ability to express disbelief and dismay at the problems of modern American life. He also criticized religious preaching and pompous (having to do with showing self-importance) senators and presented amusing quirks (particular or unusual characteristics) of the English language. Still, he referred to himself simply as a "worsifier" instead of a "versifier." British reviews of his work often criticized him for taking liberties with spelling and rhyme. One of his most famous examples is the line: "If called by a panther/Don't anther." In 1931 Nash married Frances Rider Leonard, with whom he had two daughters. His experiences with fatherhood provided more subject matter for his verse, evident in the 1936 collection The Bad Parents' Garden of Verse. Nash also wrote screenplays for three Metro-Goldwyn-Mayer films— The Firefly (1937), The Shining Hair (1938), and The Feminine Touch (1941). In California he met another well-known writer, S. J. Perelman (1904–1979), who had written for the Marx Brothers films. They worked together on a musical, One Touch of Venus, which was a huge success on Broadway in 1943. Nash was elected to both the American Academy of Arts and Sciences and National Institute of Arts and Letters. During the 1950s he wrote more frequently for the children's market, with such titles as The Boy Who Laughed at Santa Claus (1957), Custard the Dragon (1959), and Girls are Silly (1962). He also wrote for television productions of Peter and the Wolf and The Sorcerer's Apprentice. He often wrote about his experiences babysitting his grandchildren. After suffering various illnesses in his later years, he wrote a number of poems about the medical establishment that were later collected in 1970's Bed Riddance: A Posy for the Indisposed. Nash died on May 19, 1971. Several collections of his work were published after his death, including I Wouldn't Have Missed It (1975) and A Penny Saved Is Impossible (1981). Nash, Ogden. Loving Letters from Ogden Nash: A Family Album. Introduced and selected by Linell Nash Smith. Boston: Little, Brown, 1990. Stuart, David. The Life and Rhymes of Ogden Nash. Lanham, MD: Madison Books, 2000.